Also known as a ruptured or slipped disc, a herniated disc refers to a problem with the thin discs that lubricate your spine. These discs protect your vertebrae from rubbing against one another. Due to compression of the spine, discs can become irritated and even crack. This places pressure on the joints and causes pain, which may radiate along the spine or concentrate in one area. If you have disc herniation, we at Killian Chiropractic can help. Some people who have a herniated disc feel no pain at all, and the diagnosis of a herniated disc comes as a surprise for these people. Most people who have a herniated disc feel pain, weakness, numbness, and tingling in the extremities. You may feel tension in your back, even finding it difficult to move or lift things as you normally can if your herniated disc falls in the mid or upper back region. 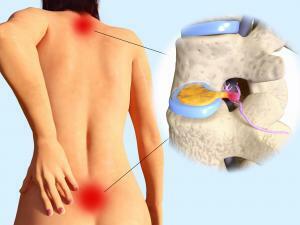 If the herniated disc is in the low back, leg, calf, and buttocks pain are common. For a herniated disc in the neck, pain is often felt in the arm, shoulder, and upper back region. Conventional treatment of a herniated disc includes the mild "rest and ice" approach, which does not solve the problem, and invasive back surgery. The good news is, we at Killian Chiropractic offer treatment options that are not invasive and do not require you to take medication. Our treatment methods are effective and work far better than the wait and see approach advocated by conventional medicine. We treat disc herniation using spinal decompression and chiropractic adjustments. Spinal decompression slowly stretches your spine using traction and gravity. As a result of treatments, we can create a vacuum in the spine where the herniated disc is sucked back into place. Manual adjustments work to relieve pressure on nerves and realign the spine, treating disc herniation. Chiropractic care also activates the nervous system, which allows your body to heal itself. To complement care, we can offer physiotherapies including ultrasound and cryotherapy. These relieve the muscle tension and inflammation that can accompany a herniated disc and promote healing. While treatment for a herniated disc using chiropractic care takes several sessions, many patients experience some relief after the very first visit. Before you try something radical like back surgery to relieve pain from a herniated disc, why not see us? Herniated discs are most common in the neck and low back, although they can occur anywhere along the spine. If you experience pain, muscle weakness, numbness, or tingling, get checked out by a chiropractor. By using chiropractic care for a herniated disc, you can resolve your health problems without resorting to something as invasive as back surgery. Learn more about our treatment of herniated discs or meet with our chiropractor yourself in a new patient consultation. To reserve yours, call us at 604-688-0724.